When you get an android with invalid imei. Looking at the picture above you can see that the baseband shows "null" in the Volcano box interface. Well the best way to fix this is to use Tecno P5 bin file(flashfile read from working Tecno P5). Volcano box or miracle box. Install both the Tecno P5 android smart phone and Volcano box driver. Press the hold Vol - to enable the driver install and the phone to connect. If not pull the battery and insert it back. Tecno P5 rom from another working phone. Note: Before you start make sure you backup the phone including software. Remove the memory card. Flash the phone with the ROM from another phone. If everything is ok, the invalid imei and baseband unknown of Tecno P5 android smart phone will disappear. Factory Hard reset will set your telephone in original factory settings. It will expel every one of the information and applications that you introduced. Your contacts will be evacuated and you need to include them once more. Zamdtek is not responsible for any damages that may happened due to using this guide to your phone. 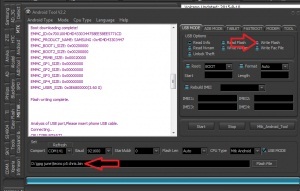 If any problem happened that related to flashing instructions, Zamdtek will help you to solve it. This is for educational purposes.